Restricted space can cause problems for both motion and positioning systems and the setups on the motion platform as well as for the surroundings. Even when great care is taken during the design of an experimental setup or a production unit, it is not always possible to avoid the risk of collision. 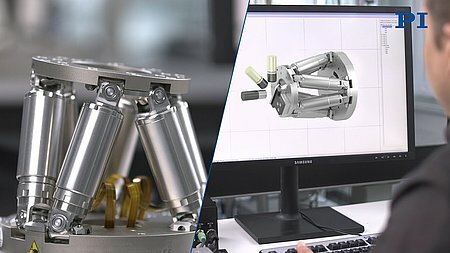 The PIVeriMove software calculates the permitted travel ranges for hexapods, if there are any obstacles in the motion range: Whether a sample setup, other moving parts or the wall of the vacuum chamber. 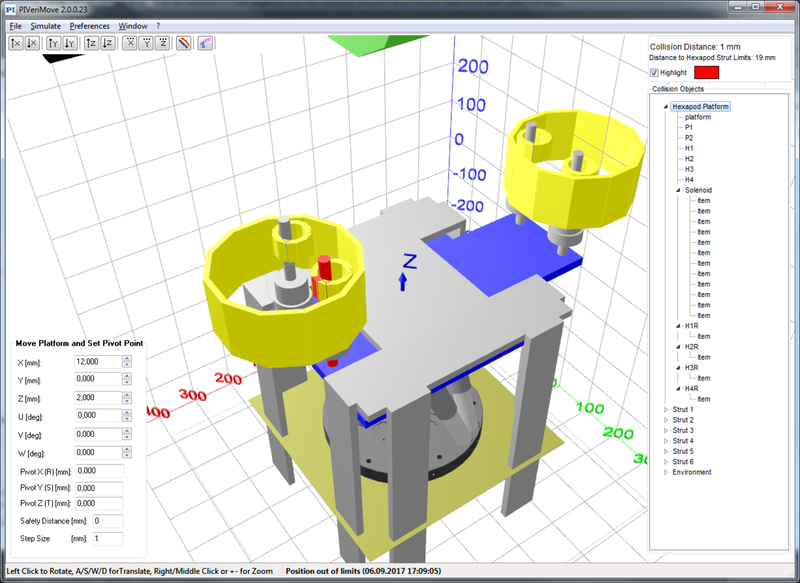 The newly created configurations can be stored as the basis for the geometric calculations in the hexapod controller. The safety gap to the objects is checked online for each motion or position command. This results in new limits for the positions that the hexapod is permitted to occupy. The target positions and all points along the trajectory where a collision could take place, are checked before being executed. If a collision is impending, the motion is not carried out. For extra safety, a minimum gap can be specified, which is added to the distance irrespective of the direction in space. The pivot point, which is the reference point for rotation of the platform can be changed at any time. The limits of the workspace of parallel kinematics vary depending on the current position (translational and rotational coordinates), the current coordinates of the pivot point, and the chosen coordinate system. 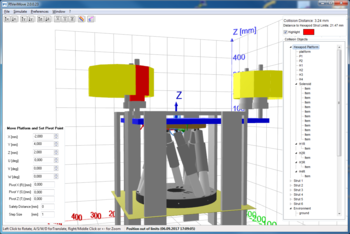 The scope of delivery of the PI hexapod software includes a program that can be used to comfortably calculate these limits and display them graphically. Mechanical problems can, therefore, be localized well before setting up the application. the forces and torques which act on the motion platform of the hexapod. These influencing factors can be simulated with the PI Hexapod Simulation Tool and possible issues can be solved early with the help of experienced PI sales engineers. It is often desirable to implement the customer software early on without the system being available on site. 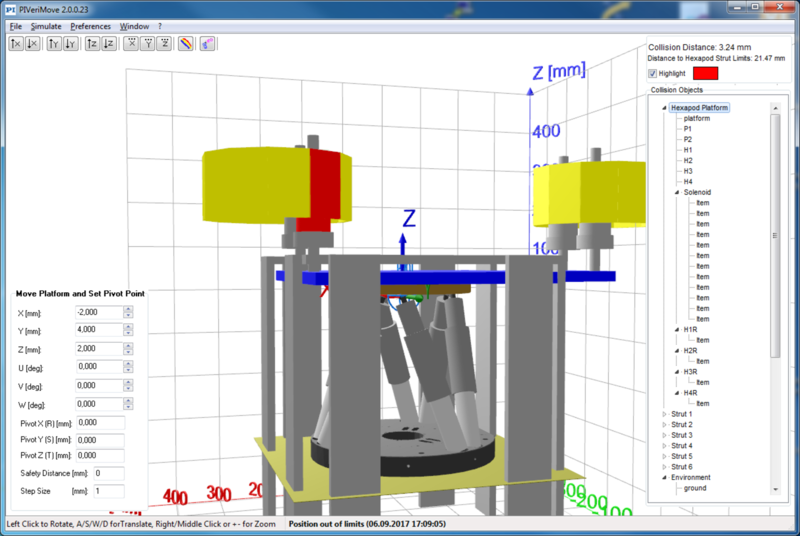 PI supplies a suitable software that can be used to simulate a complete hexapod system (hexapod mechanics and controller) as a virtual machine on the host-PC. This allows the customers to develop, test, and optimize user programs even before the system is delivered. QEMU is a free virtualization software which can emulate the entire hardware of the controller. Installation programs for Windows are available here: 32 bit / 64 bit.